“Orkney Street is a great starting point for a business.”John MacLean, Editor Govan Press, Based at Orkney Street Enterprise Centre. “Govan is such a great place to live. There are lots of first time buyers just like us.”Jude Rose, a new home owner at Park View, Golspie Street. “We have lots of regulars and we’d like to expand.” Gayle Gawel, Owner Cafe 13, 794 Govan Road, Govan. Established 2011. “It’s a pleasure to see Fairfield Shipyard Offices back in use.” Flora Pagan & Colin Quigley, volunteers at the Fairfield Shipyard Office Restoration. “There are lots of clubs in Govan. We play games, X-Box, Connect, Wii, Karaoke, team games like dodge ball and do arts and crafts.” Abbie and Megan enjoying Govan Youth Information Project. Here you can find out about all things Govan past and present, including what’s being done through the Central Govan Action Plan and Govan Cross Townscape Heritage Initiative to create a vibrant and prosperous future for this famous, riverside community. Govan is a place of great antiquity. More important and prestigious than Glasgow in medieval times, it rose to become the centre point and driving force of the world’s 19th century shipbuilding industry. Exceptionally rich in history, architecture and spirit, it is a place that people are passionate about, given its undeniable potential to regenerate and enter its third period of great prosperity. You have been warned! To arrest the economic and physical decline experienced in Govan over recent decades, public agencies, working hand in hand with the local community, developed Central Govan Action Plan: a ten year physical regeneration programme designed to make Central Govan attractive, vibrant and prosperous, a place where people wish to live, work, visit and invest. The multi-million pound plan contains a comprehensive set of actions aimed at transforming the quality of life and environment experienced in Govan including: new mixed tenure residential development; public realm improvements; restoration and reuse of historic buildings; the creation of new and improved business, commercial and community space, as well as measures to improve landscaping and movement throughout the town centre. Of course, the preservation and promotion of Central Govan’s rich heritage, particularly its beautiful surviving listed buildings, runs central to the whole regeneration strategy. 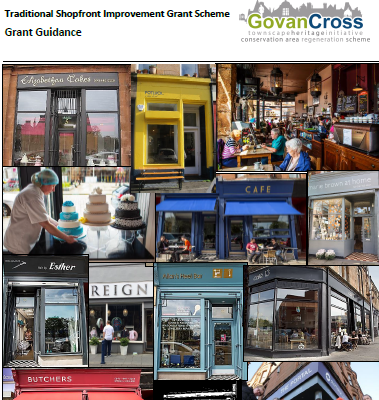 As such, Govan Cross Townscape Heritage Initiative and Conservation Area Regeneration Scheme is an essential part of the Central Govan Action Plan. Funded by Heritage Lottery, Historic Environment Scotland and Glasgow City Council, this grant giving programme focuses on the restoration and preservation of key heritage features at Govan Cross, using the improvements to bring Central Govan’s unique character to light and to boost the town centre’s commercial prospects and quality of life. So, Central Govan is once again changing. Find out how on this website and start believing.